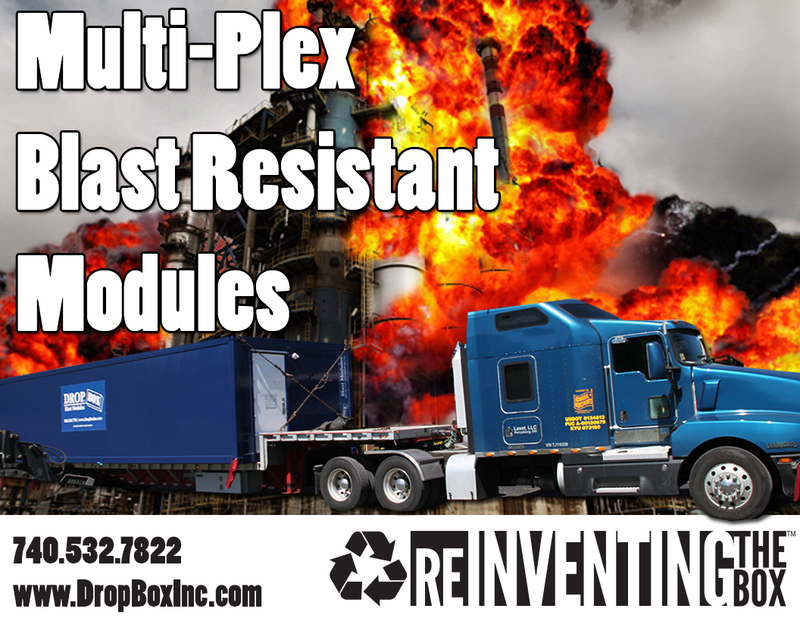 Multi-Plex Blast Resistant Modules from DropBox Inc.
DropBox Inc. can provide standard single-box blast resistant modules or custom Multi-Plex BRM units from 1 to 8 PSI that come in a variety of sizes, configurations, and floor plans. Our BRMs are available in multi-box and even stackable designs. While our standard BRMs are 12′ x 40′ with an open floor plan, we can also include restrooms and/or offices in multi-plex, mulit-box units to meet all of your spatial needs. In order to make sure your employees and contractors stay safe and productive in the blast zone with a Blast Resistant Module (BRM) from DropBox Inc. we have developed multi-plex BRM units that can be added to to create additional office, meeting, break-room, and tool crib space based on your site-specific needs. At DropBox Inc., we pride ourselves on providing excellent, comprehensive customer service as well as an in-house team of engineers, CAD draftsmen, and designers to ensure you get the Blast Resistant Module (BRM) you need regardless of the job-site, climate, and spatial needs. BRMs from DropBox Inc. are built using all-steel ISO shipping containers and/or steel kits as their base. All of the BRM units we provide are constructed to perform when and where you need them. We are the most experienced shipping container modification company in the United States, and we are ready to take on all of your BRM needs into consideration. The products we provide are portable, secure, rugged, and ready to use in a considerable amount of time savings onsite. Built with solid Corten steel construction, marine grade plywood flooring, and standardized sizes for transportation, our modules are the perfect building block. If you’d like to learn more about our Blast Resistant Modules or any of our shipping container modifications CONTACT US HERE or call us at 740.532.7822.